Immerse yourself in atmospheric music that makes you feel like you’re being wrapped in a cotton wool. 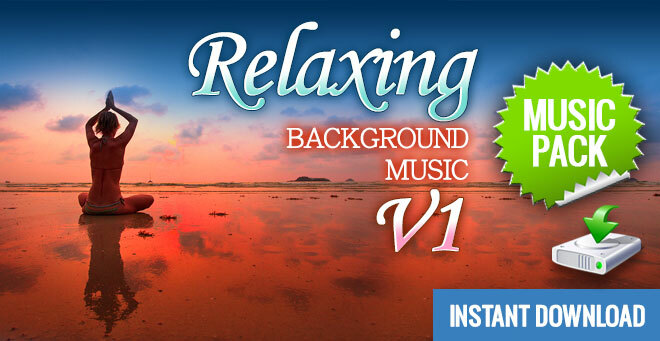 ‘Relaxing Background Music V1’ is the ultimate relaxation music pack, available right now for instant download. If you’re producing any kind of travel documentary or ‘Spa’ themed promotional video, this music pack of relaxing background music is the ideal sound track for your project. From totally ambient, to smooth and sensual, this music pack features six relaxing background music tracks that will gently massage the soul of your listeners, infusing them with a sense of complete well being. Take a listen to the previews to see if this music pack is right for your project. Your search for relaxing background music is now over. No matter what type of project you’re working on, this music pack was created to chill out your listeners and create a blissful sense of inner calm and ambient atmosphere. With ‘Relaxing Background Music V1’ we put together 6 of our most soothing tracks so that you’ve got instant access to the perfect sound track. Simply add this music pack to your cart, checkout and download. A music pack is simply a collection of music files that you can download as soon as you’ve completed your order. With this music pack you get six full songs to download in both MP3 and WAVE file format. It’s kind of like buying an album from iTunes except you’ll be licensed to use these tracks in your multimedia projects. These 6 relaxing background music tracks feature ambient sound scapes that work perfectly in anything from Yoga classes, promotional videos, cultural documentaries, and audio books to podcasts, theme tunes, movies and TV shows. Out standard Q-Music license allows all of these usage scenarios and more. See the sidebar to the right for other accepted uses. When you purchase this relaxing background music pack, you’ll get to download the files right away. It’s really simple to order and download your sounds so you can get back to working on your project. Download ‘Relaxing Background Music V1’ right now and put the finishing touches to your blissed out project.